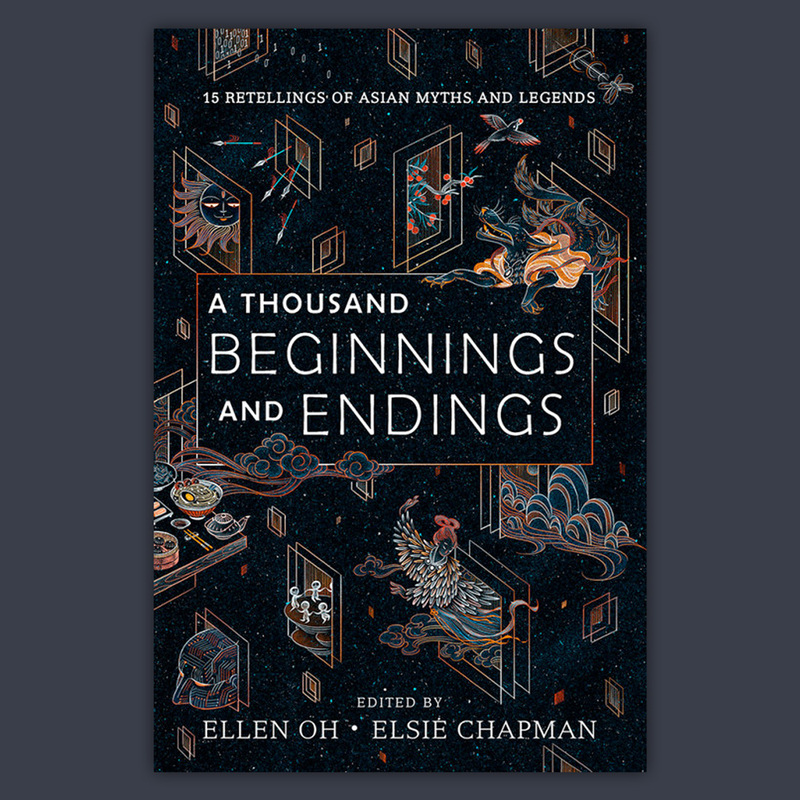 As 2018 comes to a close, I thought I’d share some of the book cover designs and illustrations from the year which have stuck in my mind. I enjoy walking around bookstores, looking at shelves, considering how covers stand out and how they grab a reader’s attention within microseconds. When done well, they are a perfect combination of text, image, marketing, and storytelling. 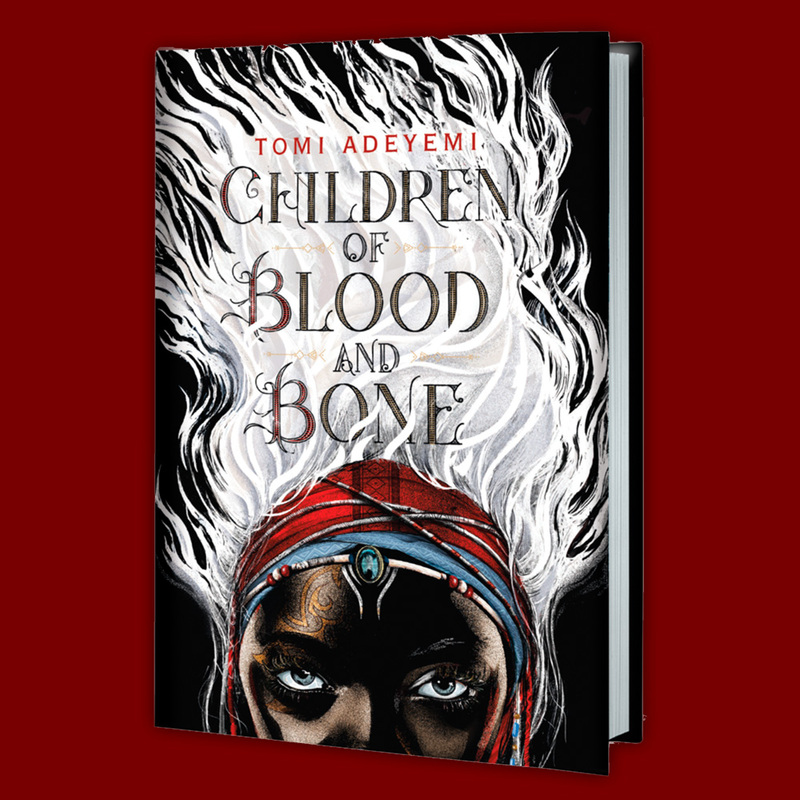 Both covers are capable of commanding your attention from across the room, especially with the embossed and foil finishing on the physical copies. 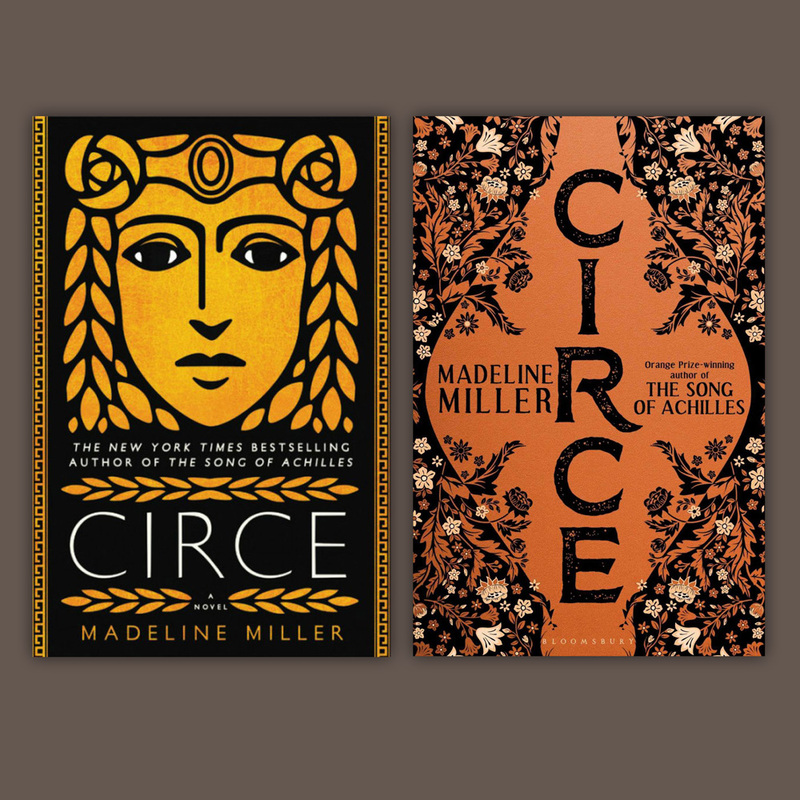 Bold, deceptively simple, fitting for this retelling of Circe’s story. Feifei’s distinct line style gives the cover a fresh and modern look when it could very easily have veered into stereotypical ‘Asian art’ territory - ink and brush painting, cherry blossom trees. 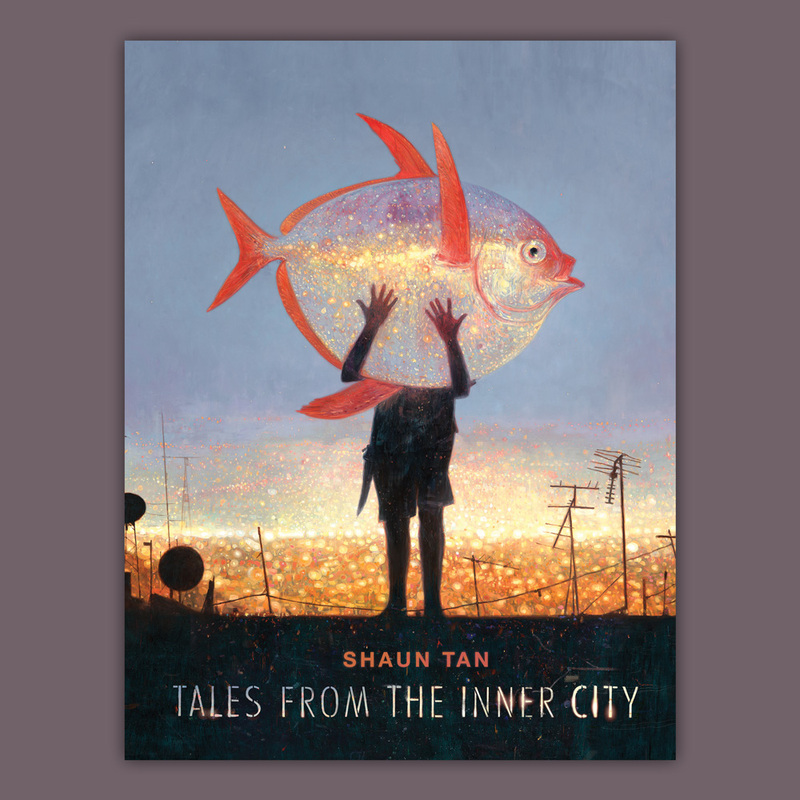 Anything by Shaun Tan is bound to be wondrous, thoughtful, and emotive. I love how the lights in the fish mirror that of the city beyond, and how none of the usual building shapes associated with cities are present. The result is a light, airy cover grounded by the dark foreground. Delort also illustrated the cover for Novik’s Uprooted, which is one of my comfort rereads each year. 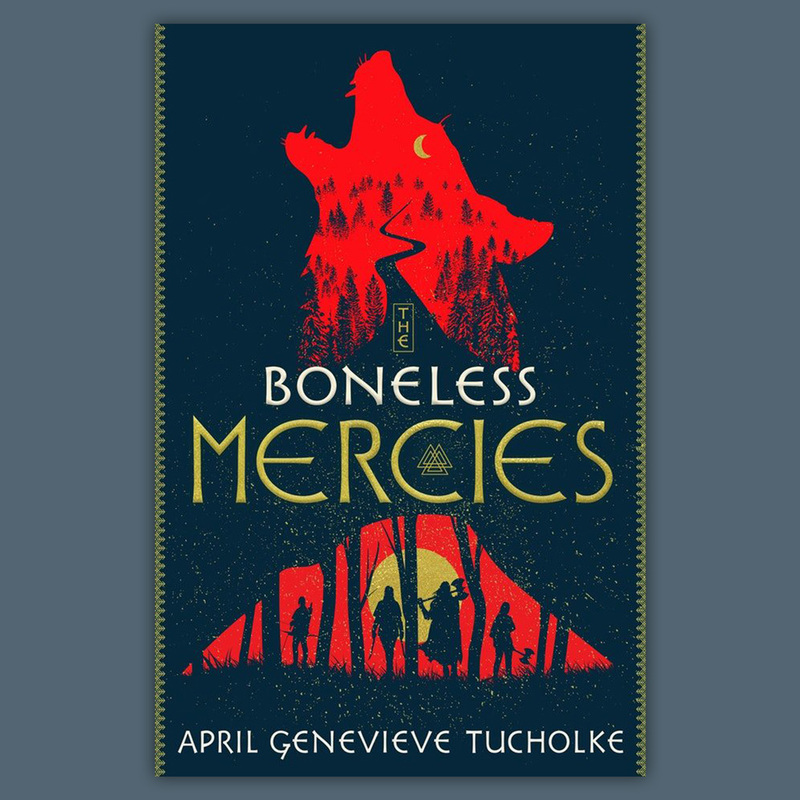 His scratchboard style works well for her reinterpretations of fairy tales; she deftly upends tropes with descriptive writing that will enchant you before you know it. I walked past a stack of these in Kinokuniya and backpedaled so fast to take a second look. I love the combination of red-gold-blue/black, the graphic shapes, the crisp, stark atmosphere it exudes. It doesn’t feel like a fantasy novel at first glance. It’s impossible to walk past this in the YA section and not pick it up. Zélie Adebola’s distinct white hair, treated in this graphic style, is difficult to look away from, and so are her eyes. Palencar’s subtly textured work has both gravitas and an unsettling, ancient feeling to it. You can’t help but imagine the possible stories behind this image. A standout in the younger readers’ section, this cover makes use of contrasting colours and strong silhouettes to highlight the heroine. McQue also provided interior illustrations for this volume, which work well even in black and white. 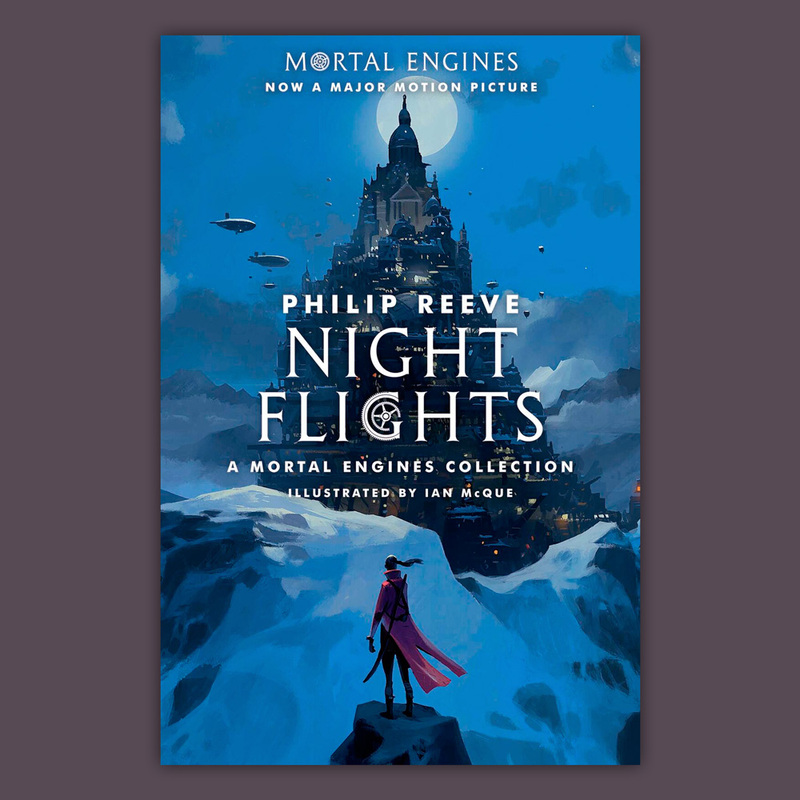 And all of his covers for the new printing of the Mortal Engines series have that wonderful balance between graphic shapes and painterly detail. 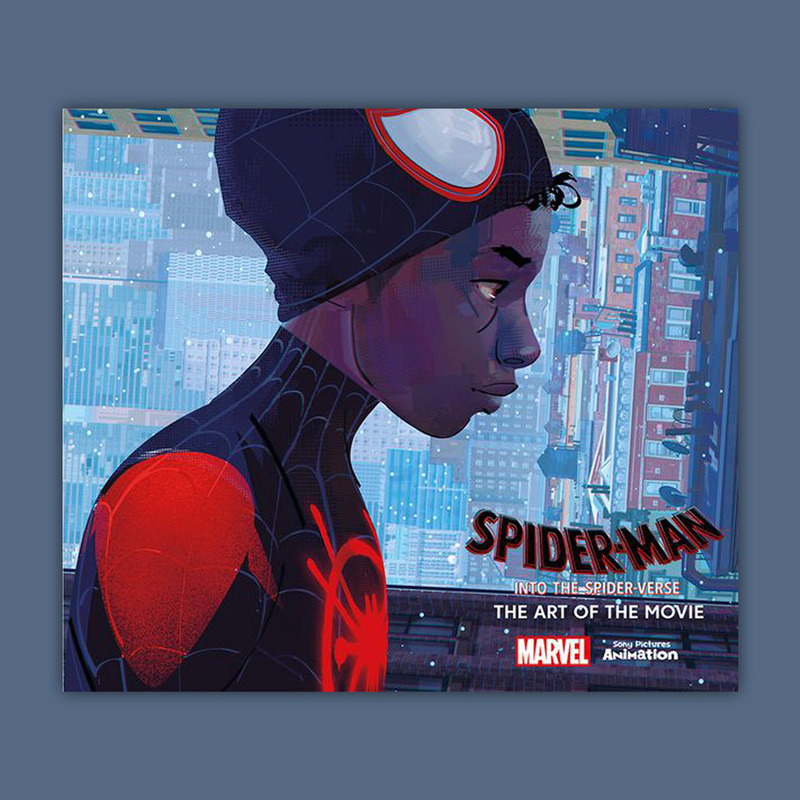 That cover image was originally a concept art painting that captures Miles in a quiet character moment. Brilliant control of values and shapes in the background to suggest the vast cityscape. And the unusual perspective is arresting. I really missed NYC/ Brooklyn as I was watching this film, which was a combination of bold visual stylisation and earnest storytelling. In May, I had the opportunity to attend the annual Illustration Master Class in Amherst, run by the same amazing folks behind SmArtSchool. It’s something I’ve dreamed of doing for years. Since then I’ve constantly returned to the insights gleaned there when working on new pieces or thinking about career directions and goals. I’ll do another post just exclusively for lessons learnt at the IMC. For now, suffice to say it was eye-opening, inspiring, and utterly refreshing to be among a cohort of people so driven and focused on making art. From left: focus group critiques; gouache demonstration by James Gurney; the view in studio 101; Boris Vallejo and Julie Bell working on their paintings. Attendees work on a piece throughout the week at the IMC, either following one of the prompts provided or using one of their own. I brought in something I’d been thinking about for a few months already - an illustration for Ursula K. Le Guin’s short story ‘The Ones Who Walk Away from Omelas’. If you haven’t already read it, I won’t spoil it except to say that it’s a story about a utopian city, perfect in so many ways save for the social contract it is built upon. Many of the instructors talked about bringing an emotional, personal connection to illustration assignments regardless of the brief. There was one thing that also influenced my approach to the piece: the seven indigenous Orang Asli children who had run away from their abusive school environment in 2015. Five of them perished in the jungle and only two were found seven weeks later, thanks to a combination of negligence and disinterest by the authorities. I was a teacher in a public school back then and deeply shaken by the news. For students to run away and perish because they feared their teacher’s mistreatment - that is the worst thing possible. There is a child in Omelas, far beneath the city in a dark room, and I would base that child on the seven children. 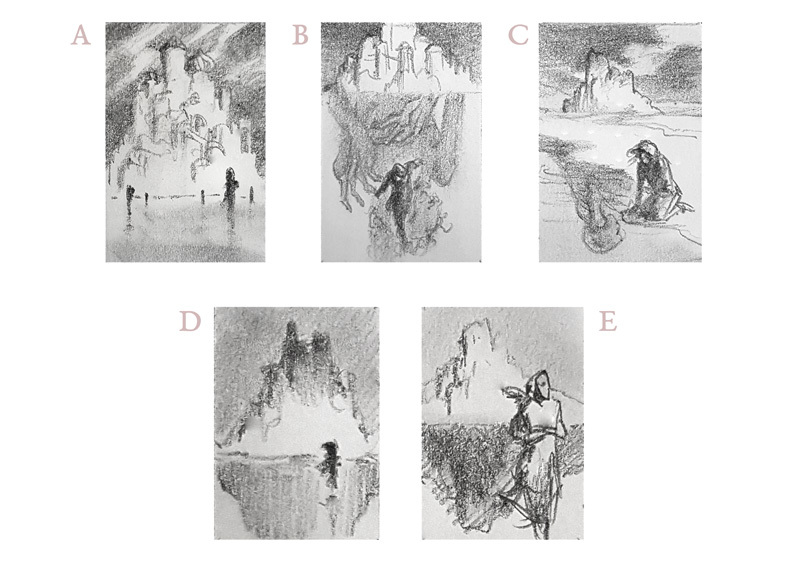 Rough thumbnails. These were presented and critiqued in focus groups consisting of participants and instructors. Inspired by James Gurney, I made a maquette which didn’t end up being used, but was still insightful. Preliminary sketches for the child, based on images from news reports. Being in the same room as so many experienced artists, I have the benefit (and drawback) of receiving tons of helpful feedback and critique on the piece. Learning to decide which to use, to listen to the work itself, and to stay true to my original, quiet vision for it, is essential. Thank you to everyone who helped this come together! Slowly building up the city with ink and white pastel pencil. In between attending lectures, watching demonstrations, and trying to catch up with sleep, I spend time exploring what I could do with sumi ink - making large washes of textures, layering it slowly to build up the face and city. Wet-on-wet, the ink lays down in gorgeously soft gradations on Arches hot press sheets. After creating all these physical layers, the next step is to scan and pull them all together digitally back home. My scanner is an Epson V370 that only takes A4 surfaces. Thanks to the wonders of technology, I can scan in parts, making sure to keep the piece aligned in the same direction to the scan bar so the paper texture is lit uniformly each time. Batch > Photomerge in Photoshop will usually do a good job of stitching the parts together, unless it fails in which case you might have to crop/ rotate the individual scans as closely as possible before trying again. 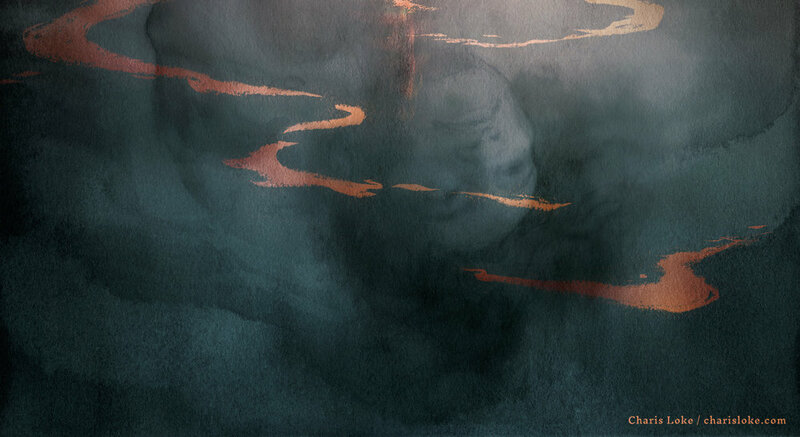 Some of the ink layers, with a preliminary digital wash of colour laid down with the round soft brush. Working in Photoshop allows me to explore options in the middle of the process rather than needing to have a somewhat concrete idea of the final early on. I approach colouring in Photoshop the same way Justin Gerard does in this Muddy Colors post: building it up in layers set to various layer modes. Multiply, Soft Light, and Overlay are the MVPs here. Because the story walks a fine line between abstract and concrete - the narrator asks the reader to imagine Omelas as they will - this could be reflected via colour choices that aren’t entirely realistic. A hint of nightfall, coupled with low sunset light bathing the city in a romantic glow, seems appropriate. I paint the character and ripples on separate sheets of paper. Scanning them in, I position, skew, and resize as necessary. Next comes adjustments to values and the texture of the paper in some areas. The granulation and tooth in the middle could do with some toning down, but I do want to retain it at the edges of the city and the bottom of the water. I duplicate the water texture layer, run a High Pass filter on it, then set that to Overlay. I save two versions - one with, one without this additional texture layer - so I can layer mask out areas I don’t want textured with the gradient tool. And here we are, at the end of a long journey. While there are things I might have done differently, as far as learning goes, I’m pleased with the various things I discovered while working on this, both conceptually and technically. Can’t wait to put them to use in future pieces! Stay tuned for an #inktober2018 project, up next on the blog. 'Rules for Communing with Spirits' by Christopher R. Alonso is the latest story at http://firesidefiction.com. It's an evocative tale about a breakup, learning to listen, coming to terms with control...and seeing spirits. Thanks to Pablo Defendini, Fireside's awesome art director and publisher, for the opportunity to illustrate it. The story takes place among the Cuban community in Miami, and it was important that this be shown. I spent a lot of time researching the area, looking at photographs of funerals in those traditions. 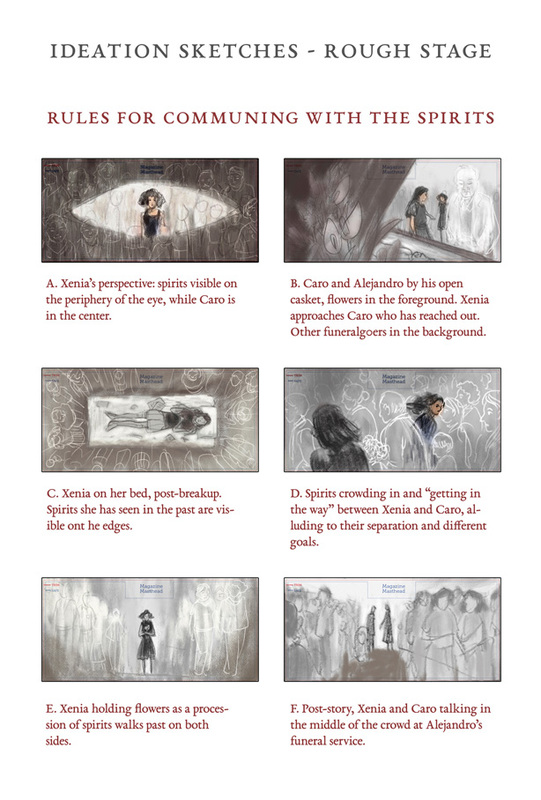 Since none of the spirits' faces are visible in the illustration, their clothes (guayabera, flowery blouse, etc) had to communicate the cultural context. When planning the image, I wanted to emphasise the relationship between Xenia and Caro and suggest a kind of slow, inevitable fraying. This was best shown in thumbnail D - their contrasting directions and the spirits flowing between them serve to further illustrate the growing gap. Pablo liked this idea too. I developed D into a colour sketch. At this point, 80% of the image has been figured out, and all that remained was to paint it. Xenia and Caro were painted with ink on watercolour paper; each of the spirits was drawn separately on thin parchment paper. I then scanned everything in, composited, and coloured the image in Photoshop. This process allows me to be flexible and adjust individual elements even at a late stage. Getting the same degree of luminosity with a purely traditional approach would have taken a great deal more time, and going a 100% digital route loses a lot of the textures that are a key part of traditional media. Be sure to read the story online! This also appears in the first ever Fireside Quarterly magazine as a fold-out poster, alongside art by Kevin Tong and Michelle Wong and many other kickass stories and articles. If you subscribe you'll receive a print copy. Exciting!